Weighty Matters: Breaking News! The Holy Grail of Deep Fryers Found! Breaking News! The Holy Grail of Deep Fryers Found! This is a deadly serious post. I, like most, enjoy French fries. I even "buried" two deep fryers in my pre-med days of bachelorhood. Now of course I know French fries are not good for me (potatoes not so good either), but that said, sometimes they're worth the risk though usually my "fries" take the form of home-made, oven baked fries. The days of fake fries may soon be over! Soon I may be back to "real" fries. 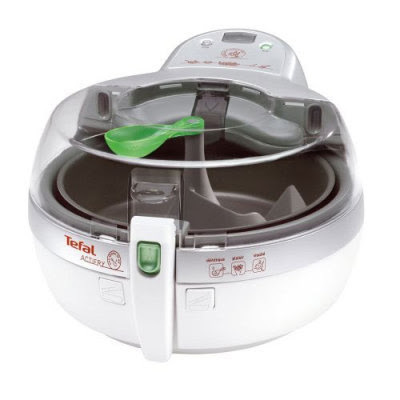 Apparently T-fal has figured out how to make a deep fryer that fries 2.2lbs of potatoes using only one measly tablespoon of oil! T-fal folks, if you're reading and want to send me a machine to try out (they're not yet available for purchase in Ontario) I won't complain and will happily review. Bliss doesn't come cheap however. $350 and apparently ready for market late this year.